Professionally designed and printed on A4 70/90 GSM paper. Wide variety of design options, Upload or leave us to design, E-Proof PDF provided for approval. Media: Acid-free, 70/300 gsm weight, smooth finish, 90% white maplitho paper. Printing Type: Digital/offset based on quantity. Size mentioned are approximate, Finished business card may vary ±0.5". 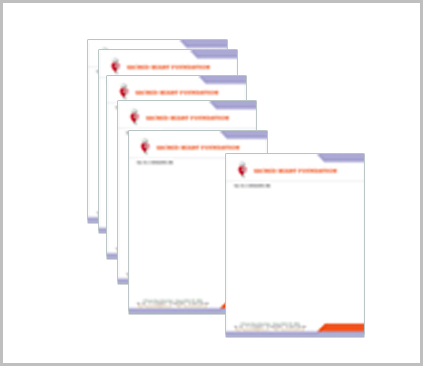 Letterheads are perhaps one of the most used tools in every business. Any transaction that requires written documents such as sending mails, office memos, product handouts and sales sheets are opportunities to increase brand awareness. Create the perfect design for your letterheads which is both appealing and informative to your target market. Vivid Print offers custom printing for your business letterheads! Print your letterheads in 70gsm paper uncoated. Order from 1000 up to your wish pieces and have them ready for shipping in 2 to 4 business days! Navigate our calculator to and upload your file to place an order. We offer free file check service to make sure your designs are print-ready.